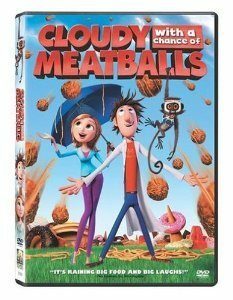 Cloudy with a Chance of Meatballs Only $4.99! You are here: Home / Great Deals / Amazon Deals / Cloudy with a Chance of Meatballs Only $4.99! Woo hoo! I have a great deal for you on one of our family’s FAVORITE movies! Right now, you can get Cloudy with a Chance of Meatballs on DVD for just $4.99 (reg. $9.99)! And, shipping is FREE with Amazon Prime or Super Saver Shipping! We have watched this one SO many times! Not only does my daughter love it, but it’s one of my husbands and my favorite’s as well! Flint Lockwood (Bill Hader), a clever young inventor with a reputation for creations gone awry, has recently completed a machine that he claims will turn water into food. Like his past failed inventions, Flint’s new food-converting machine doesn’t work as planned, and on its initial test run it ends up getting launched into the sky where clouds form and begin to rain cheeseburgers. The falling burgers destroy the Swallow Falls community’s latest attempt to bolster its failing, sardine-dependent economy, but the Mayor’s (Bruce Campbell) initial fury quickly turns to greedy anticipation as he begins to realize that food falling from the sky could serve as an innovative tourist draw. As the entire town is caught up re-defining itself as “Chew and Swallow,” only Flint’s father (James Caan) remains skeptical of his son’s invention. Greed leads to some very strange weather events like spaghetti twisters and extra-giant food which, while providing a huge career opportunity for brainy weather intern Sam Sparks (Anna Faris) who’s masquerading as an air-headed television personality, also threaten to destroy the town and its inhabitants. In the end, only the collaborative efforts of Flint, his father, and Sam can save the town of Chew and Swallow from certain destruction by the out of control invention. Cloudy with a Chance of Meatballs is a funny, imaginative film that’s well-animated and immensely entertaining for kids and adults. Rated PG for brief mild language, but appropriate for most ages 5 and older.